We’ve always known foxes prowled about; a few years ago, Nathan had been awakened in the middle of the night by what he swore was a woman screaming. While this might not seem a likely scenario in suburbia two miles from the land of Big Box Retailers, we’re on three wooded acres with plenty of dark, so he figured he’d check. What showed up in the circle of his flashlight beam was a pair of foxes. Mating. 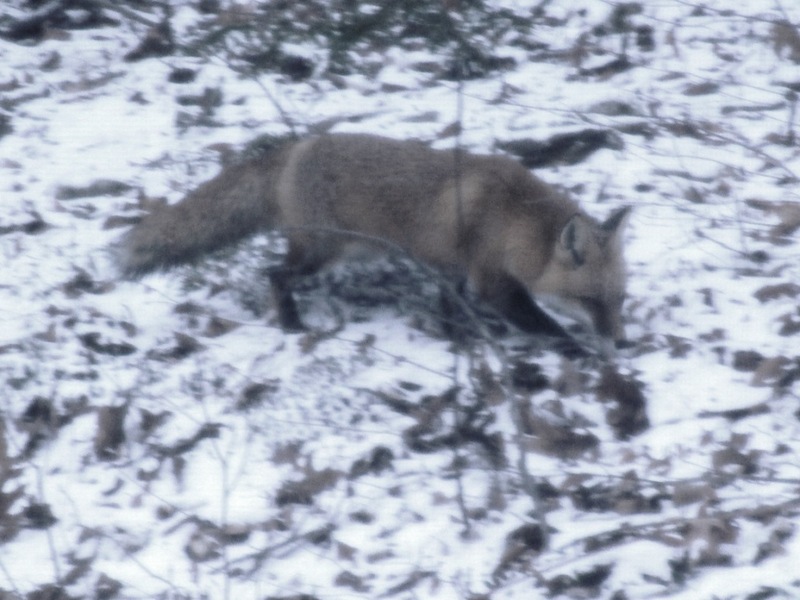 I’ve heard the fox (or foxes) screaming many times since then, and it does sound like a woman shrieking. If you’re sitting out there alone at night it’s chilling. 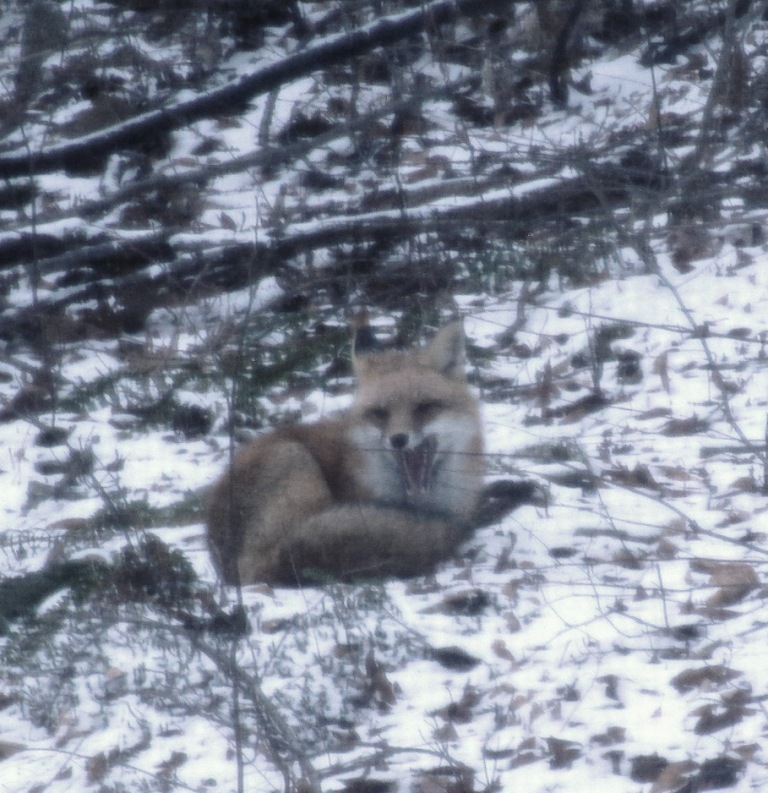 We had often told our friends about the occasional screaming, but the foxes never seemed to do it when they were over (and we have people over a lot). New Year’s Eve. Nathan had built a fire in our firepit on the back porch, and my friend Rob and I were standing out there when a fox—sounding rather close—started screaming. Rob was astonished. There were lots of inappropriate jokes, but then Nathan pointed out he’d cleaned out the refrigerator earlier in the day and thrown the carcass of a Stew Leonard’s roasted chicken in the woods. I ran for my camera and captured the sound on video (you can play that clip at the bottom of this post). 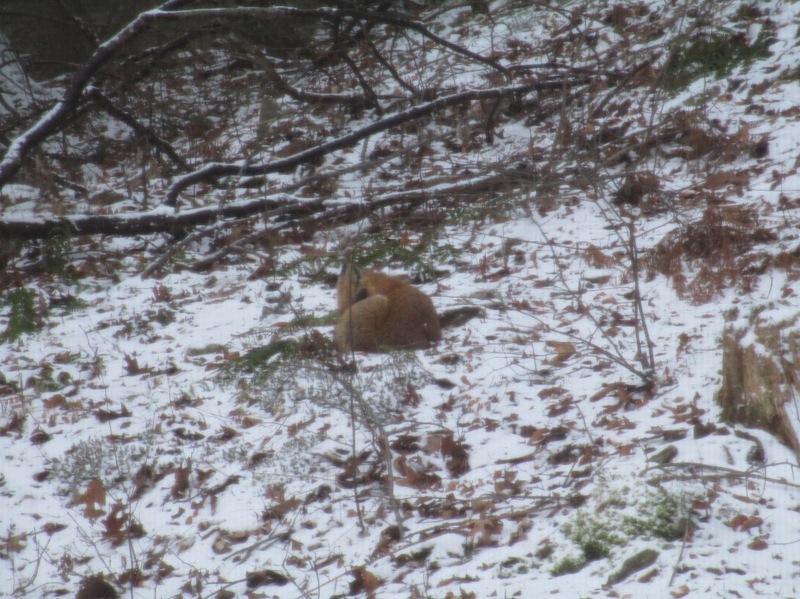 What was amazing is that this fox was not afraid: Our house was full of noise (you can hear some of our other friends partying just inside the kitchen windows), and there were children playing outside at our neighbors’ across the valley. 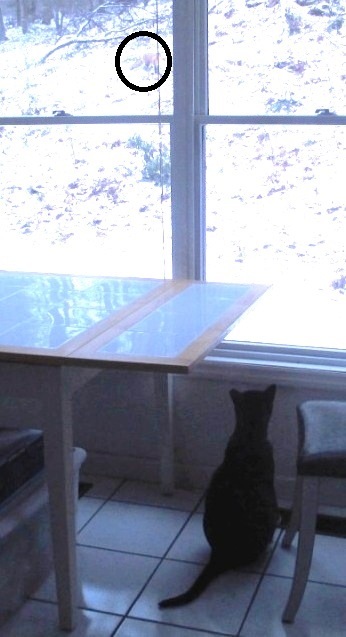 He is looking for a place to sit. Or something. I don’t know if this is a male or female, but balls either way. He’s totally aware of me, my housemate, and the cat. He looked right at us (see pic at top of post). Mikey is all set to check him out. I don’t think so, dude. (Mikey on floor at right; fox in black circle. Sorry for bad photo; my camera was on the wrong setting). 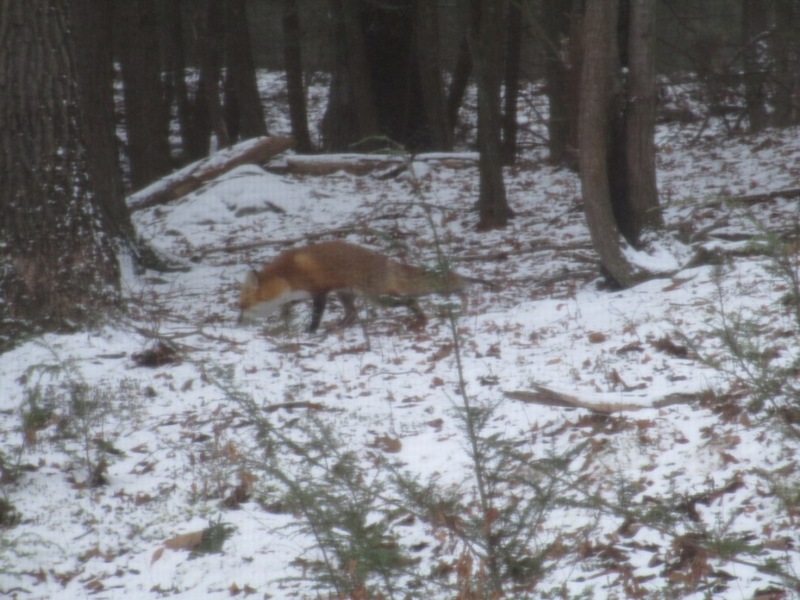 Fox skulks off into the woods. And so ends my 2014 adventure. Nowhere near the Call of the Wild, but still pretty cool—and a reminder that we don’t always have to go to the ends of the earth to experience the wonders of nature. So happy birthday, Jack London! Want to know more about London or read his work? Here’s a wonderful website maintained by the Jean and Charles Schulz Information Center at Sonoma State University which has an online archive of many of his stories and novels you can read for free—in addition to tons and tons of resources about London and his life and times: http://london.sonoma.edu/. Until then, enjoy the fox screaming. It’s creepy. You’ll hear talking from people inside my house and the sounds of little kids playing nearby. The single scream is the fox. It repeats a few times, so if you miss it, keep listening! 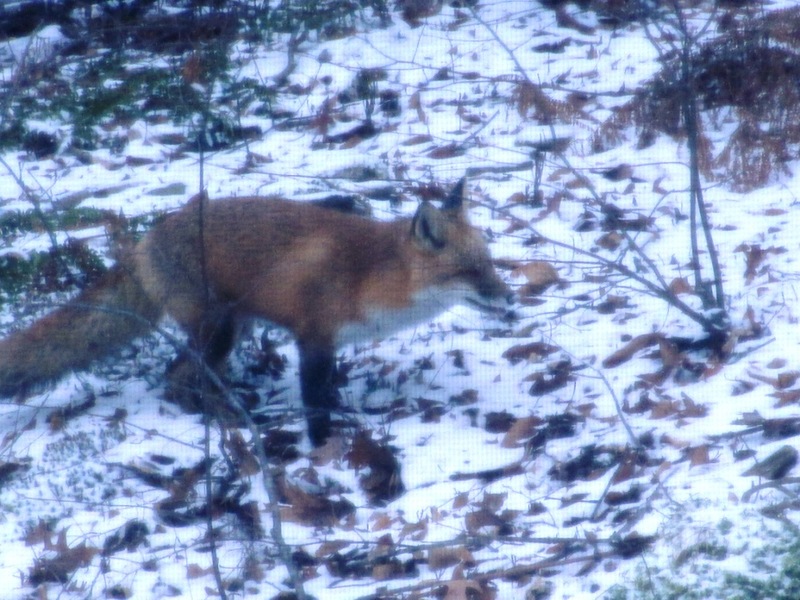 Posted on January 12, 2014, in Deep Thoughts & Fun Stuff and tagged foxes in Connecticut, Jack London, odd things happening on New Year’s Eve, The Call of the Wild, what does a fox sound like. Bookmark the permalink. 2 Comments. Thank you, Gail! Hope all is well with you, too! It’s been a little crazy here. I’ll be doing posts with more photos soon.